The number of foreign dancers in Russian ballet companies increases every year. This is not surprising, since the Russian ballet school is respected all over the world. Several foreign names have joined some of Russia’s well-known ballet companies. The Bolshoi Theater invited David Hallberg from America. Koike Saori from Japan started her dancing career in Iwata Ballet School and now works in the Kremlin ballet. Kimin Kim and Keenan Kampa dance at the Mariinsky Theatre. "The Adventure Begins,” says the status on Hallberg's Facebook page in his first month in Moscow after becoming the first American soloist of the Bolshoi Theatre. Hallberg was born in the small town of Rapid City, South Dakota. At 8, he found inspiration through films of Fred Astaire and began tap-dancing at a local after-school dance program. Later, his family moved to Phoenix, Arizona, where he first saw the ballet, and in 1997 attended the Arizona Ballet School. There, he was taught by a former Boston Ballet soloist, Kee Juan Han. At 17, Hallberg continued his studies at the School of the Opera de Paris, then, two years later, attended summer courses at the American Ballet Theatre in New York and received an ABT national scholarship. In 2011, Hallberg accepted the offer of the Bolshoi Theatre artistic director, Sergei Filin, and became principal dancer of the Bolshoi Ballet, where he rehearses with Alexander Vetrov. He added that having this sort of challenge felt like dancing a new ballet, because it was a completely different version and a more detailed approach to his role. “I'm really happy in the Bolshoi Theatre, and I feel like I inspire the dancers to certain degree and they inspire me as well,” Hallberg said. Over time, Hallberg became visiting principal at the ABT. “American dancing is exciting and explosive”. On other hand Russian ballet tends to be more based on historical references. According to Hallberg, the difference between Russian ballet school and the American one is like “night and day.” He calls his own style international. “It's not exactly American, French or Russian, but I've been trained in all of those styles,” Hallberg added. He said he feels like he needs to represent personally expert American training. 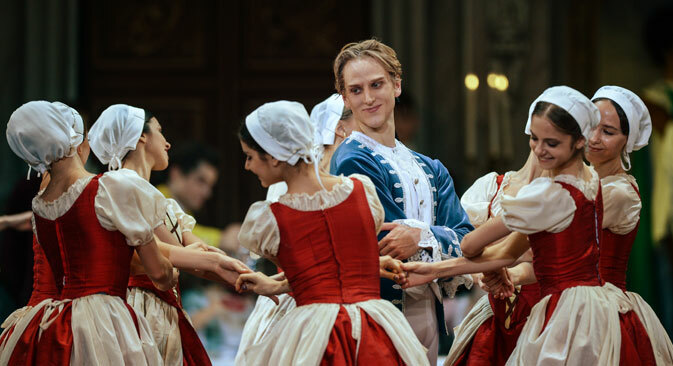 Russian ballet for Hallberg obviously means one of the most comprehensive and historic schools in the world, along with the French school at the Opera de Paris. “It's one of the best training grounds for classical ballet,” he said. Hallberg created the Innovation Initiative at the ABT, a forum for choreographic exploration and the David Hallberg Scholarship, an annual mentorship for aspiring male students of dance. Moscow life for Hallberg is quite fascinating, because he really had to settle in and become a Muscovite without being able to speak Russian. He has great friends outside the Bolshoi Theatre, and he admits that it's great to have this balance between his work and social life. Hallberg finds it difficult to speak Russian in Moscow because everyone wants to practice their English with him. Morihiro Iwata heard a lot about Russian ballet in his childhood, when he watched videos with Vasilyev, Solovyov and Baryshnikov. In Tokyo in 1989, when the Institute of Russian Ballet opened, Morihiro became one of its first students. A year later, he was offered a scholarship at the Moscow Ballet School, which he gladly accepted. “It was very interesting to get to know more about Russian ballet, so I decided to go to work at one of the Moscow ballet companies where foreigners could work,” he said. “It was the Russian Ballet State Theatre, under the direction of Gordeeva. I really believe that the Russians and the Japanese are spiritually close. It is primarily expressed in honoring their traditions, in caring for the native culture and customs, in respect to their ancestors." Iwata then worked 17 years at the Bolshoi Theatre, but unfortunately, ballet is a profession of the young. After reaching retirement age, he decided to try his hand at directing a ballet company and went to Ulan-Ude, Buryatia. "I was invited several times to the festival of folk dances of the east called the Wreath of Friendship,” he said. “There I chaired the jury, met great Buryat artists, and they invited me to work later in the opera house." Iwata also loves Siberian culture, because the Buryat and the Japanese are both Buddhists, so they have the same cultural roots. His success as the head of the ballet theater is marked in the increase in ballet audiences. During his time at the Buryat State Academic Opera and Ballet Theatre, Iwata directed several productions, such as "Walpurgisnacht,” “Don Quixote,” “The Blue Bird” and “Tamasha.” Two latter ballets are his own productions. Currently, Iwata is preparing the third International Larisa Sakhyanova and Pyotr Abasheyev Festival of Ballet Art. Artists from the Bolshoi and Mariinsky theatres will take part in this festival. Foreign ballet dancers in Russia face the same difficulties as all foreigners in Russia, Iwata said. This is primarily a work visa or a residence permit, finding an apartment and, of course, knowledge of Russian.